It’s now easier than ever to repair damaged circuits, thanks to Circuit Tracks. Circuit Tracks are rectangular shaped conductors made of 99.9% pure CDA 11000 copper. These rectangular ribbons closely conform to the original conductor dimensions. The replacement Circuit Track is bonded in place using prepackaged epoxy included in the kit. This kit is a great time and labor-saver and an easy solution to repairing missing or damaged circuits. 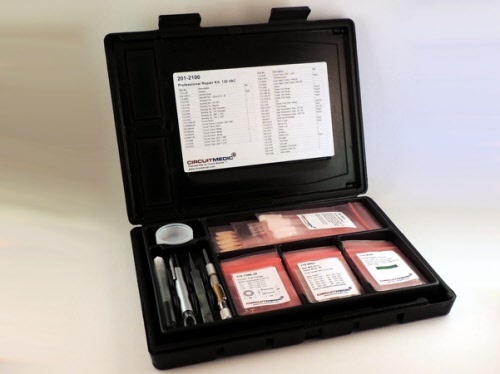 The tools and materials in this kit let you evaluate the IPC recommended process for replacing damaged surface mount and BGA pads, lands, and edge contacts. It’s the ideal, low-cost way to “test drive” and evaluate this money saving repair process. 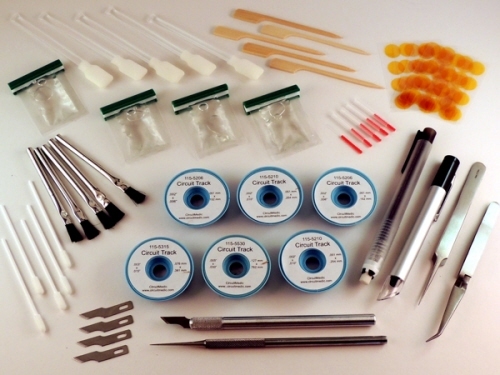 You can choose this kit to refill the kit mentioned above.